BrandBROTHERModelMFC-J430WPrinting MethodInkjet All in OnePrinting Resolutionmaximum dpi Up to 6000 x 1200 dpi? Print SpeedMax. Black Print Speed â€‹â€‹(ppm) 33ppm Black? Max. 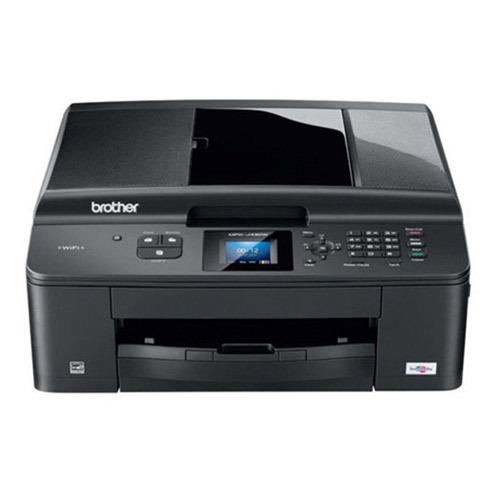 Color Print Speed â€‹â€‹(ppm) 26ppm Black? SO-based Print Speed â€‹â€‹(black)? 10ppm Black? (ISO / IEC 24734). ISO-based Print Speed â€‹â€‹(color)? 8ppm Black? (ISO / IEC 24734) Paper Size PrintingA4, A5, A6, Exe, LTR, LGL, Photo 4X6 "(102X152 mm ), Index Card (127x203 mm) . , Photo-2L (127x178 mm ), C5 Envelope, Com-10, DL Envelope, MonarchScan ResolutionOptical 2400 x 1200 dpi. Interpolated 19,200 x 19,200 dpiScanning Bit Depth48-BitCopy SpeedMax. Black Copy Speed â€‹â€‹(cpm) 22cpm Black. Max. Color Copy Speed â€‹â€‹(cpm) 20cpm Color Copy Resolution Up to 1,200 x 1,200 dpi ( white - black) . Up to 1200 x 1,200 dpi ( color ) Copy Reduce / Enlarge Settings25% -400% increase at 1% NetworkWireless. (802.11b/g/n) Fax Transmission SpeedApprox. 7 Sec. Per PageFax MemoryUp to 170 Page Fax MemoryMemory Size40 MBInterfaceUSB 2.0 Hi-SpeedCartridgeLC-40BK Black Ink Cartridge (Standard Yield) 300 pages. LC-40C Cyan Ink Cartridge (Standard Yield) 300 pages. LC-40M Magenta Ink Cartridge (Standard Yield) 300 pages. LC-40Y Yellow Ink Cartridge (Standard Yield) 300 pages. LC-73C Cyan Ink (High Yield) 600 pages. LC-73M Magenta Ink (High Yield) 600 pages. LC-73Y Yellow Ink (High Yield) 600 pages. LC-73BK Black Ink (High Yield) 600 pagesDimension (W x D x H) 405 x 378 x 180 mm Weight9 kg Warranty1Y.